Estimated Time to Complete: Approx 2 hours per caliper after removal from the car. 48 hours to allow paint to cure before reinstalling. !!!WARNING!!! - This task can be a little tricky, so if you don't think you're up for the job, DO NOT ATTEMPT THIS!! Brakes are nothing to fool around with if you're not completely sure of what you're doing!! A mistake could land you in the hospital or morgue, and your car in the junkyard!! If you have little or no experience with brake work, forget you ever saw this writeup, and let a professional handle this job!! 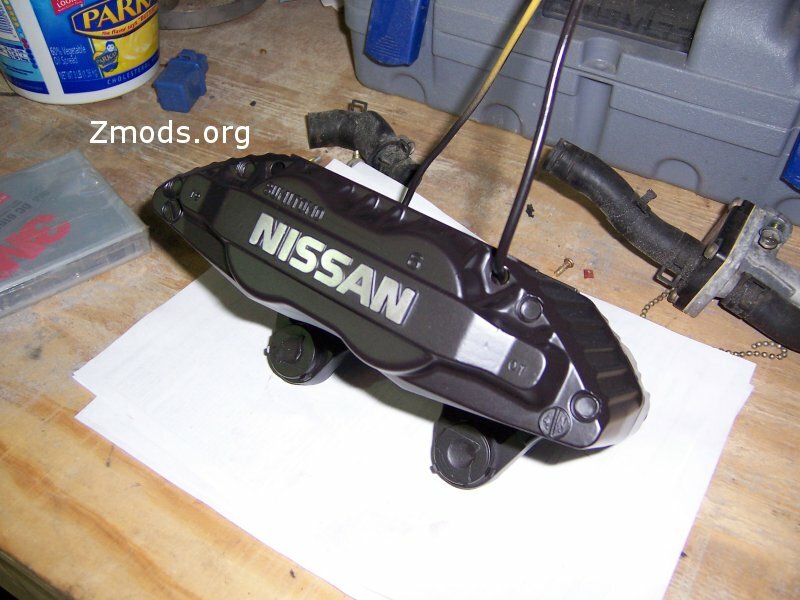 I also recommend purchasing a set of core calipers off a parts car to do this on, as this procedure is time consuming. 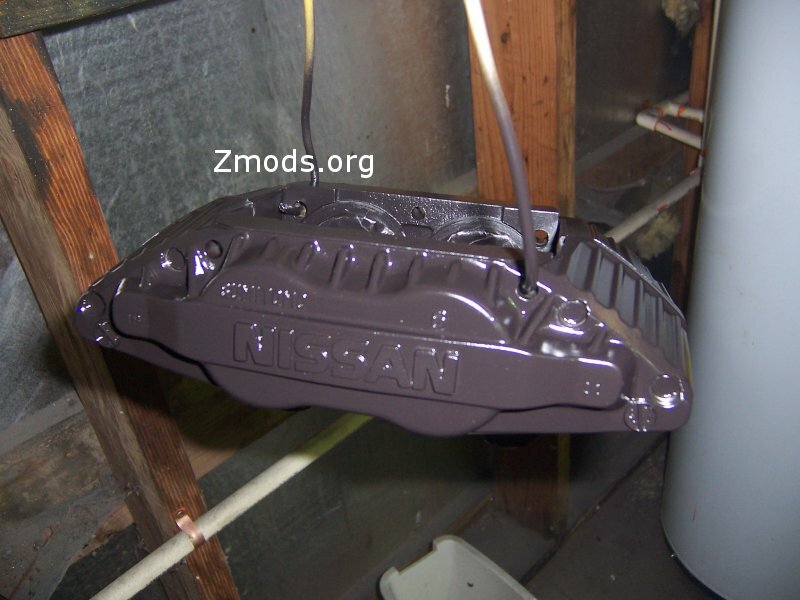 It will take a few days to do it right and allow the paint to cure, in which time your car will be out of commission, which is not an option if your Z is a daily driver. 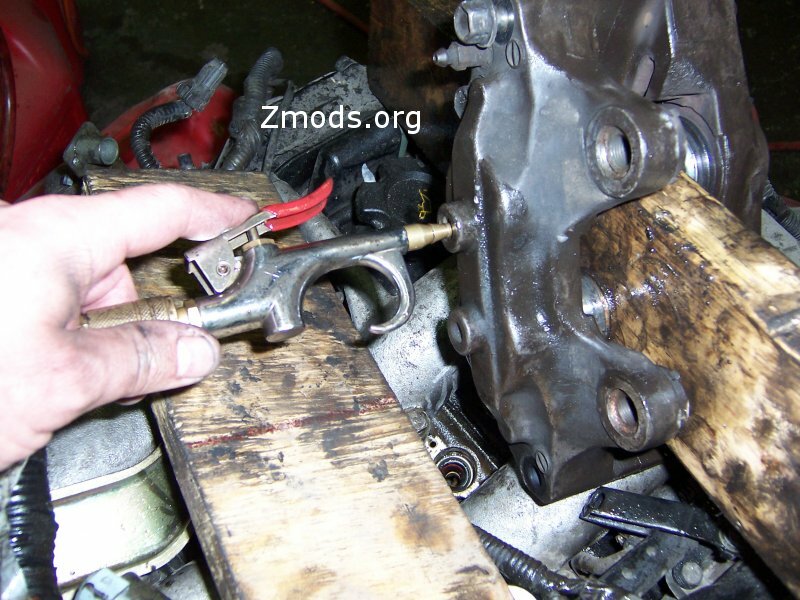 Its a lot easier to do this to some spare/core calipers, that way the brake lines aren't left open very long, and you can still drive your car while working on this. 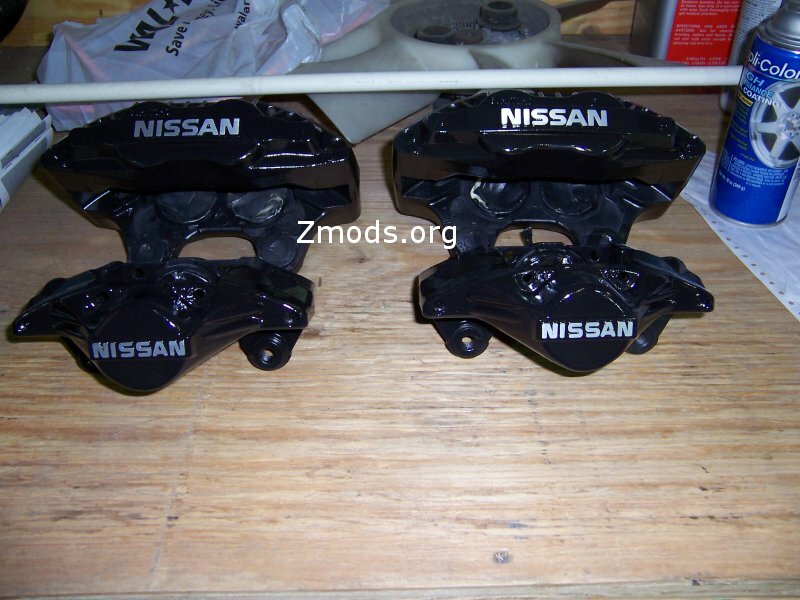 This is also a perfect time to upgrade from the scrawny 26mm calipers if you have an early 1990 model NA. 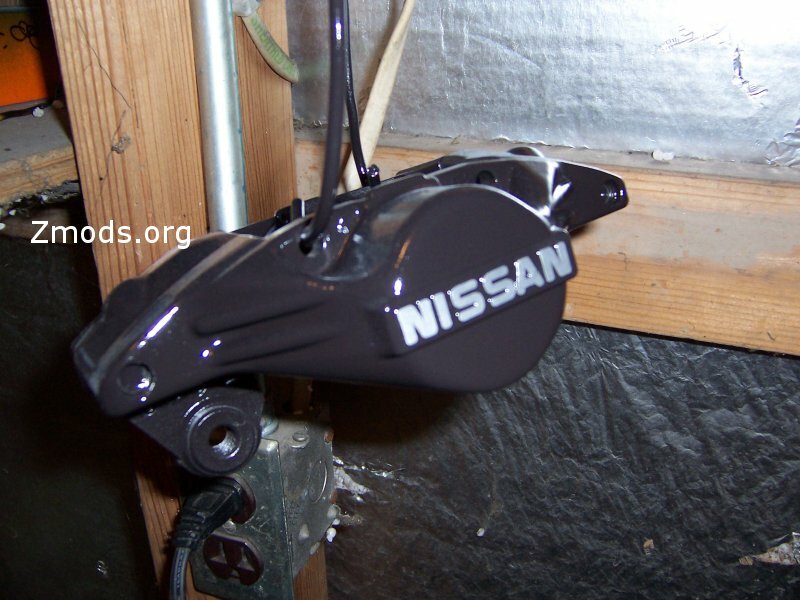 When you're finished, you can resell your original calipers and recoup your money spent on the rebuilder set you bought. With the above out of the way, now the fun begins!! 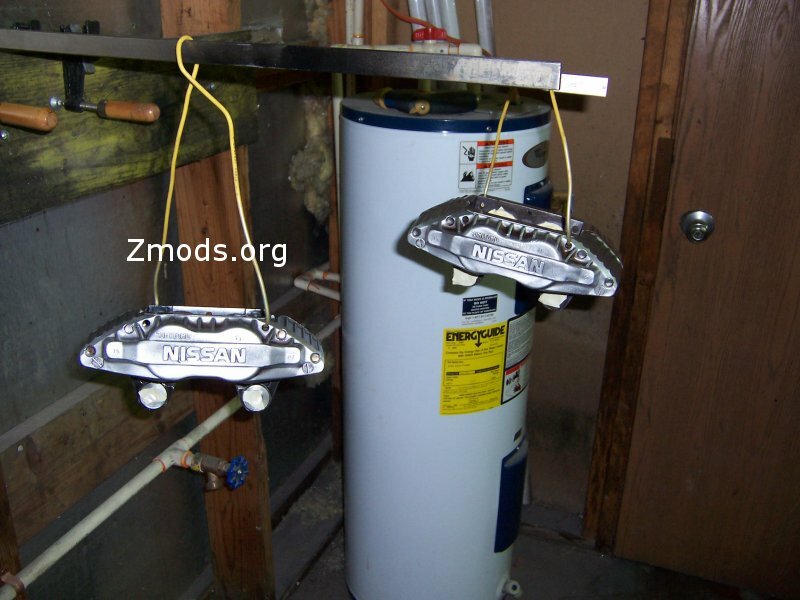 These are a set of 30mm aluminum calipers I pulled off a 1991 Twin Turbo parts car. They were high mileage, and had definitely seen better days.....until now!! The first thing you want to do is remove the pads and all the pad retention hardware. If you're reusing your old pads and not replacing them with new ones, you need to mark their orientation!! This is VERY important!! They need to go back on in the same location they came off! 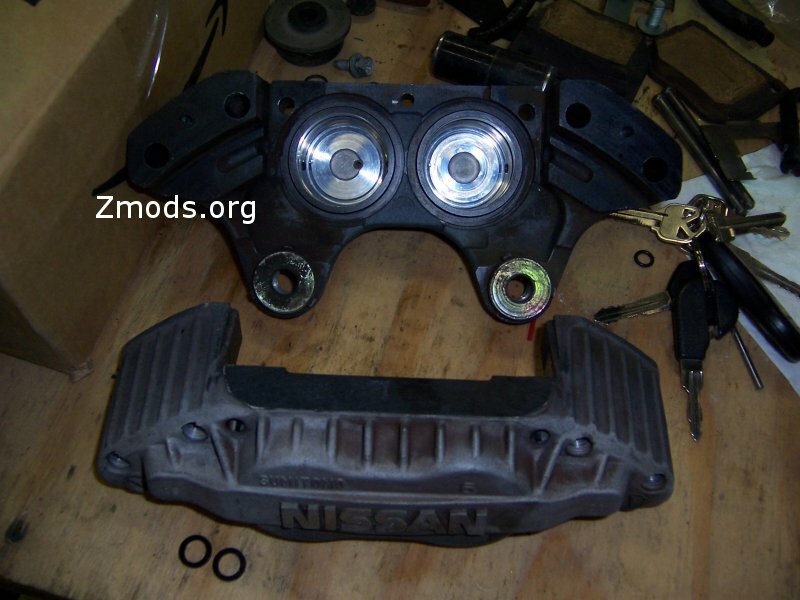 Now that the pads and their hardware is out of the way, you now want to remove the rubber dust boots and retainer rings from the caliper pistons. Use the fine tipped awl and simply pop the metal ring off. The boot may come off with it. If it doesn't, just grab hold of it and pull, it will come off easily. You may discard these items in the trash FOR THE FRONT BRAKES ONLY, they will not be reused. The rebuild kit contains new replacements for the front brakes. You MUST SAVE the dust boots and O rings for the rear calipers!! Be VERY careful not to puncture the dust boots with the awl during removal on your rear calipers!!! 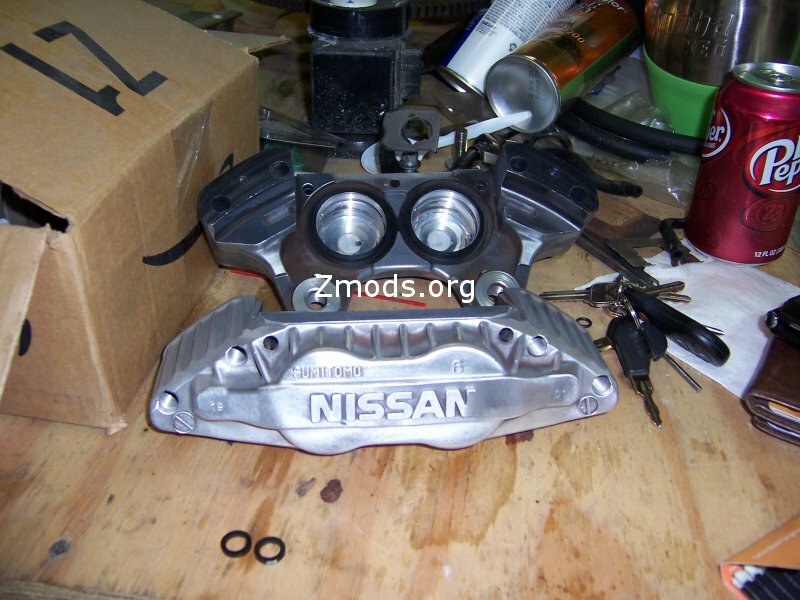 The rear rebuild kits are NLA (no longer available) from Nissan!! On this note, they VERY VERY rarely ever fail, so this is nothing to worry about, you can reuse the O rings and dust boots without fear! When you remove the O rings and dust boots from the rear calipers, simply inspect them for damage. Damage you want to look for will be torn dust boots or damaged O rings (signs of leakage, cracks or chunks missing). It's not likely you'll find any. 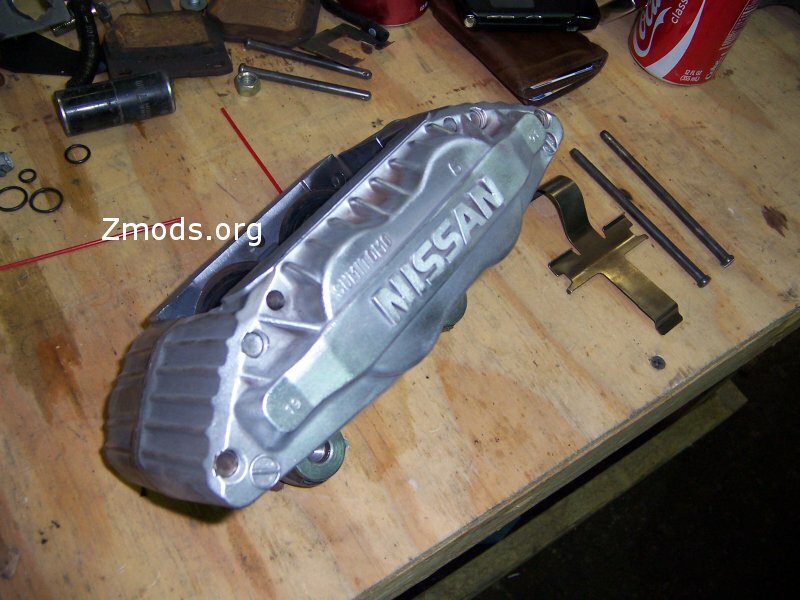 If for some reason you do, you'll need to replace that caliper. 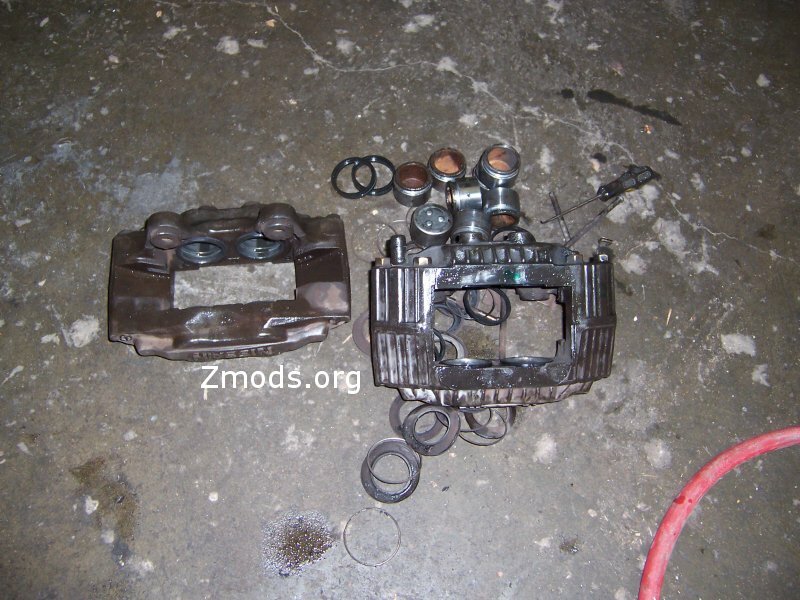 The pistons now need to be removed from the caliper. This next sequence can be a bit tricky, especially if you have a sticky piston. A stuck piston is not too common, but it can happen. The pistons should come out fairly easily with the aid of an air compressor. 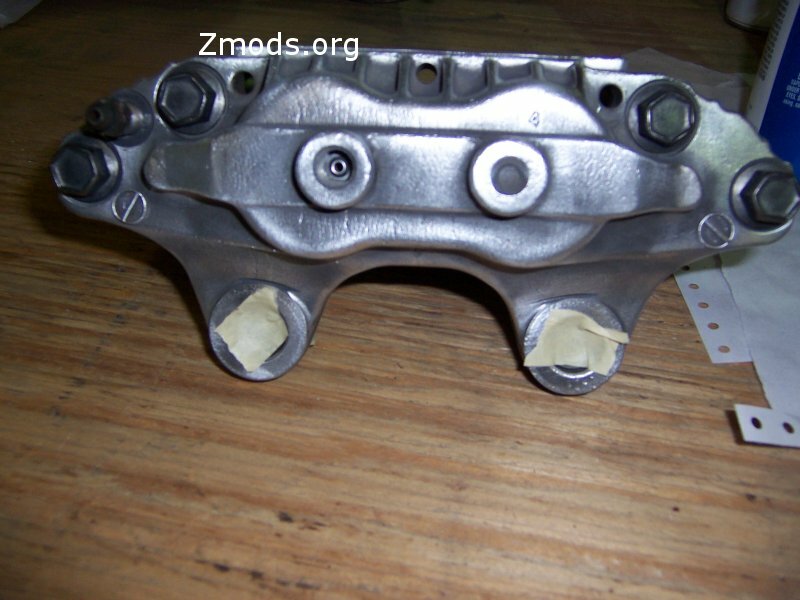 If the piston is seized, the caliper may need to be replaced. 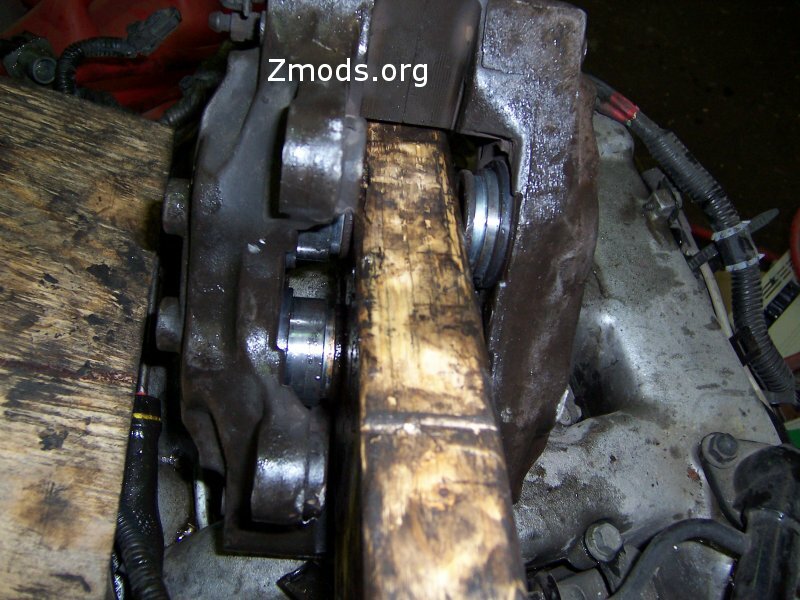 Place a 2X4 up the middle of the caliper, between the pistons. 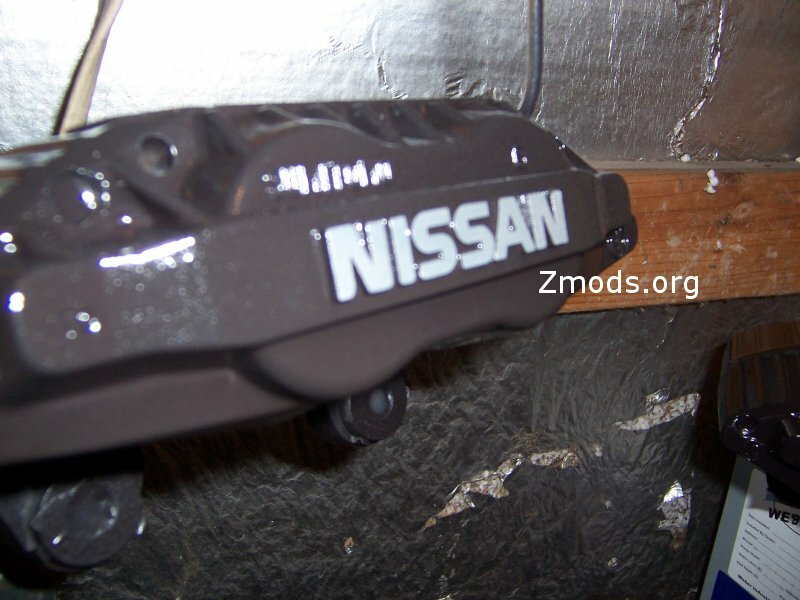 Then place your air hose with a small nozzle chuck attached over the line fitting on the back of the caliper. Make sure the bleeder valve is installed and tight. Get yourself into position, making sure your fingers are NOWHERE NEAR the pistons!!! When you shoot the air into the caliper, the pistons will come out with some velocity! If your fingers are in the way, it can definitely cause injury!! When in position, give it a shot of air. The pistons will start to come out and converge on the 2X4. 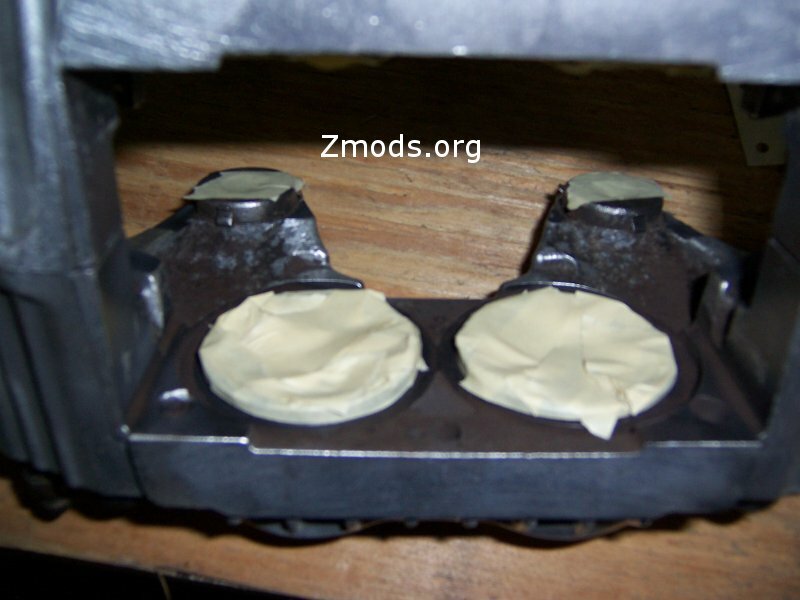 If any one comes completely out, leaving other still seated, slide it back in just enough to reseal, and shim the opposite side of it with thin wooden shims to keep it in its cylinder, allowing the others to come out. 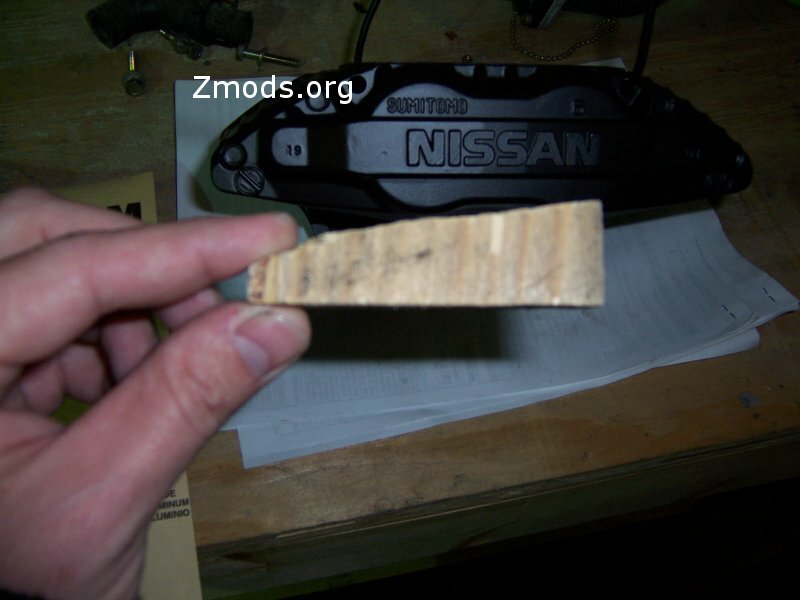 On the rear calipers, use the same technique, just use a thinner piece of wood. I used a piece of 3/4" plywood, it worked fine. 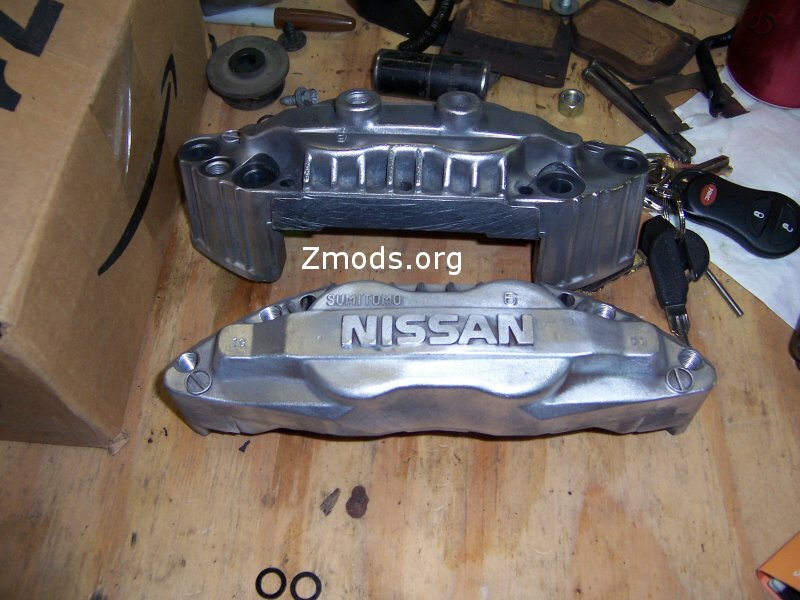 Once all the pistons are protruding from the caliper like the ones on the left in the picture above, they should pop out with little effort. If they're still too tight to pull by hand, you may use some large pliers. If you need to use pliers, grab the outer lip that the dust seal rests in!!!! DO NOT GRAB THE PISTON SIDES!! If you scratch or score it, the piston is ruined, as this will cause leaks!! In this sequence, we will be splitting the two caliper halves apart. Place the caliper in your bench vise, and snug it down. 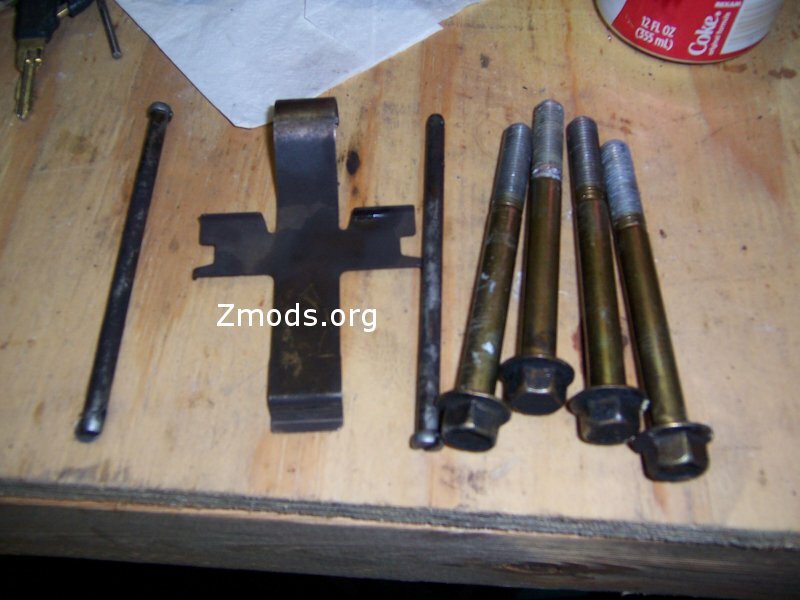 Using a 14MM socket & ratchet, loosen all 4 of the bolts. 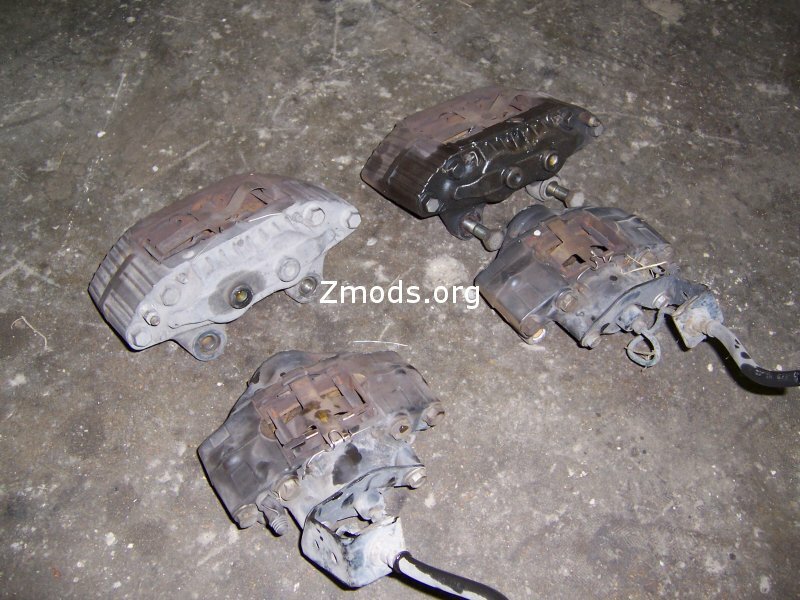 Once all 4 are loosened, go ahead and remove them from the caliper. Make sure you have a hold of the caliper half that's not in the vise, as when the bolts are removed, it may fall. Separate the halves, paying VERY close attention to two small O rings between the halves!!! They may fall to the floor or stick to the caliper. DO NOT LOSE THESE!! The kit does NOT include replacements for them, so these need to be kept safe for reuse during reassembly!! Ok, this sequence is chemical washing of the caliper. This is where those cans of brake cleaner will be used. I did this outside, as it can be messy. You want to douche (< heh) the caliper halves VERY thoroughly!! Make sure you get the fluid journals and the cylinders clean of all fluid and dirt, same with the exterior. I recommend wearing rubber gloves when doing this, as the brake cleaner can irritate your skin, and you WILL get some on your hands!! I have tough skin when it comes to things like this, and I'll admit, this stuff bothered me. This sequence is also another self explanatory one. You want to wire wheel all the embedded and caked on brake dust off. I strongly recommend wearing a respirator or dust mask when doing this!! 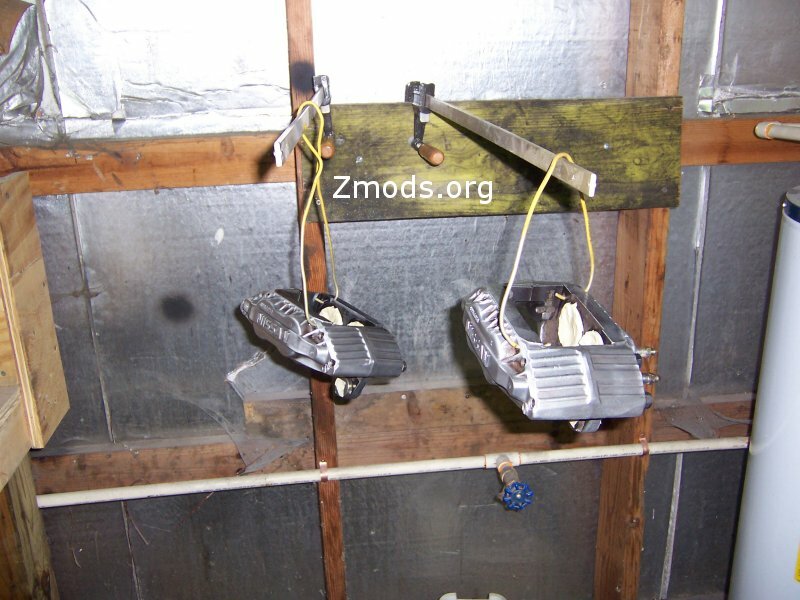 Brake dust is contains asbestos. Not something you want to be inhaling! Run the wire wheel over all accessible surfaces of the halves. You want to get into all the crevices, removing as much of the dust as you can. DO NOT allow the wire wheel to get into the cylinders!!! Also, do not wheel the mating surfaces where the halves join. 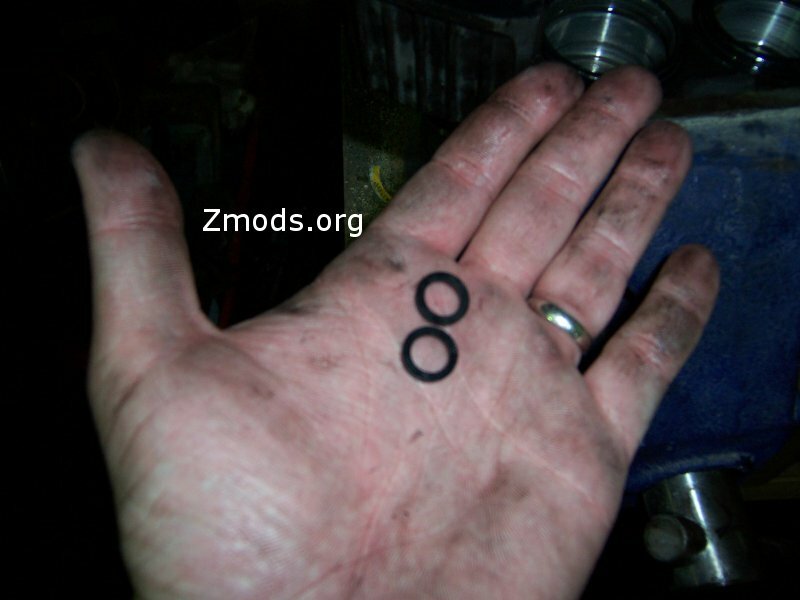 Make sure the O ring seats are clean and free of debris, but don't wire wheel them if you can help it!! Wire wheel the pad retention hardware and the 4 bolts as well. 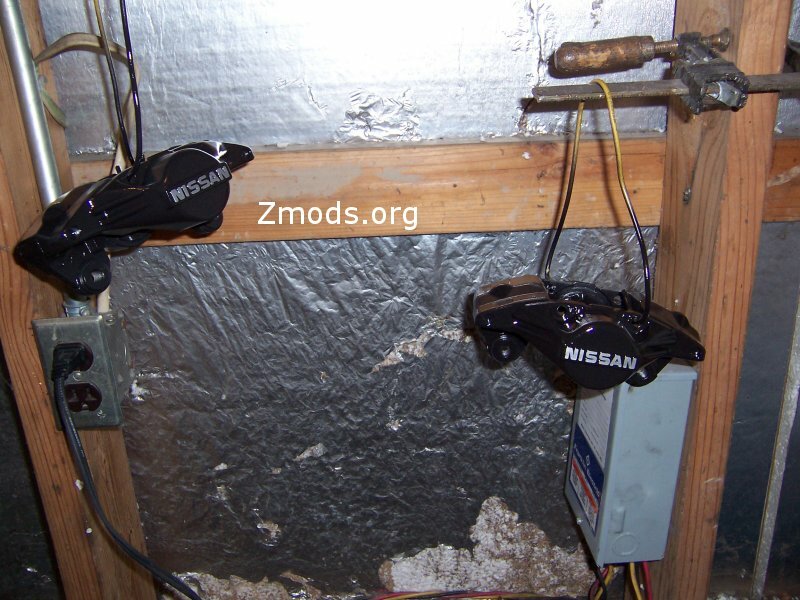 On the bolts, make sure you wheel off any rust or corrosion on them. 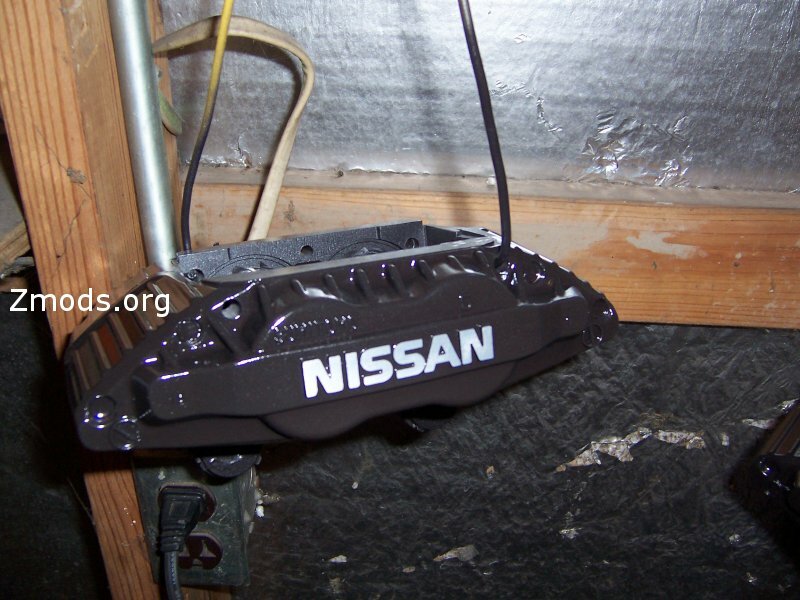 Make sure you get all the crud and brake dust off the bolt heads, or this may cause problems later with the paint. You now want to reunite the two halves. Put the front half in the vise. Before reuniting the halves, you may want to give the halves a blast with compressed air, just to make sure you left no dust in anything. Step 4: <-- VERY IMPORTANT!! Don't skip this step!! Place the O rings in their seats. Place the back half onto the front half, making sure the O rings don't shift around or move. 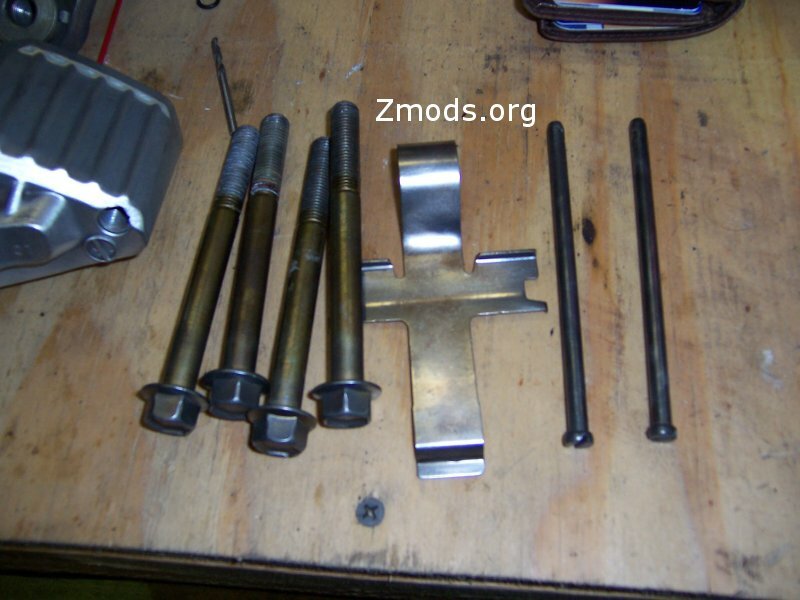 Insert the bolts, holding the halves together with your hand, not allowing them to shift around. Hand tighten the 4 bolts. Torque the bolts to 60 ft lbs. In this sequence, you want to mask off things that you don't want paint in. Mask off all of the cylinders, including the outer lips. 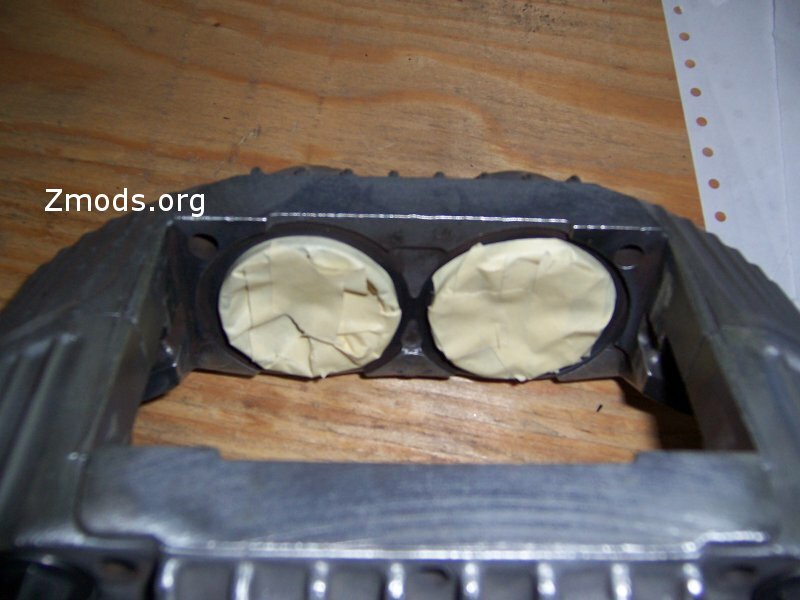 Place a small piece of masking tape over the front and back of the bolt holes. You don't want paint in the threads. Place something in the line hole. I used an old bleeder I had. If you use a bleeder, you'll have to first grind the tip off it to allow it to fit. Also, make sure it's free of any oil or brake fluid. You now want to take a rag and wet it good with acetone or lacquer thinner. Wipe down the whole caliper with the soaked rag. 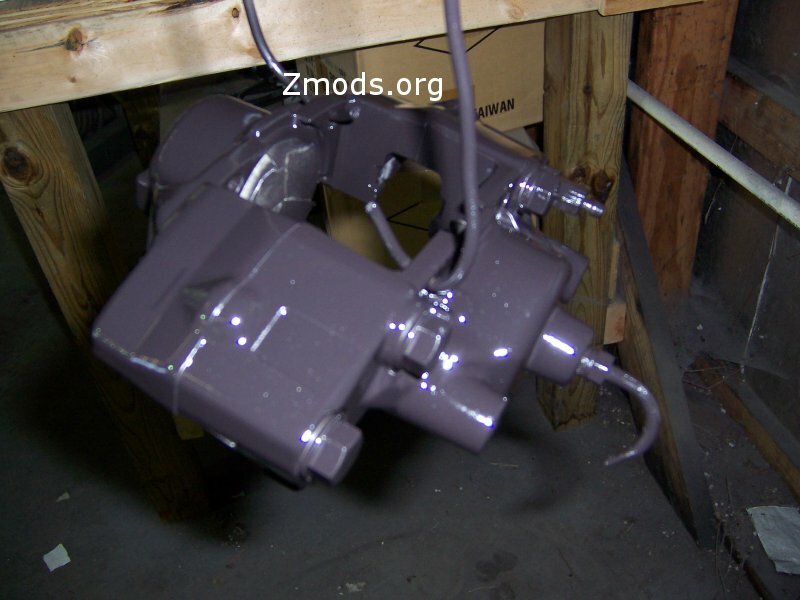 This will remove any residual contaminants you may have gotten on the caliper from handling it after the chemical cleaning and the wire wheel cleaning. After wiping it down thoroughly, do not touch it with your bare hands again!! 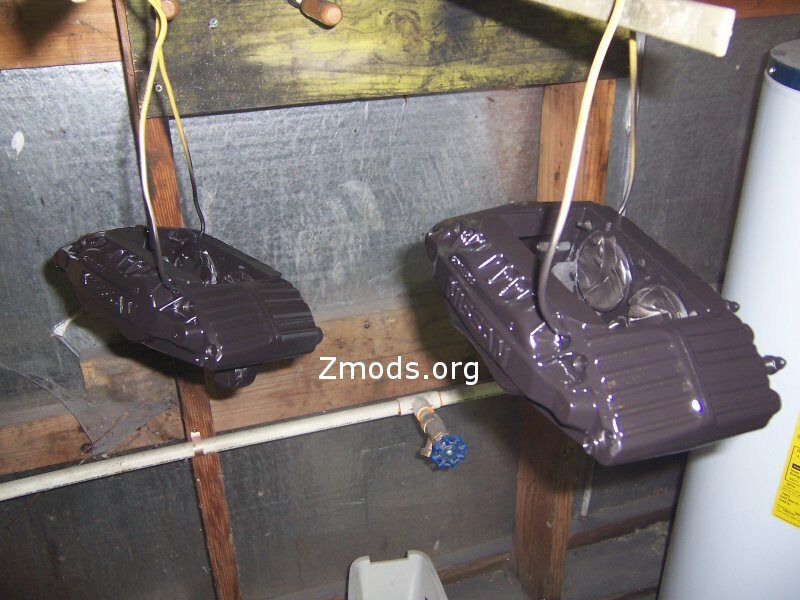 This is the final paint prep step before you actually spray them. If you get oil from your skin on them, the paint may not stick in those places. 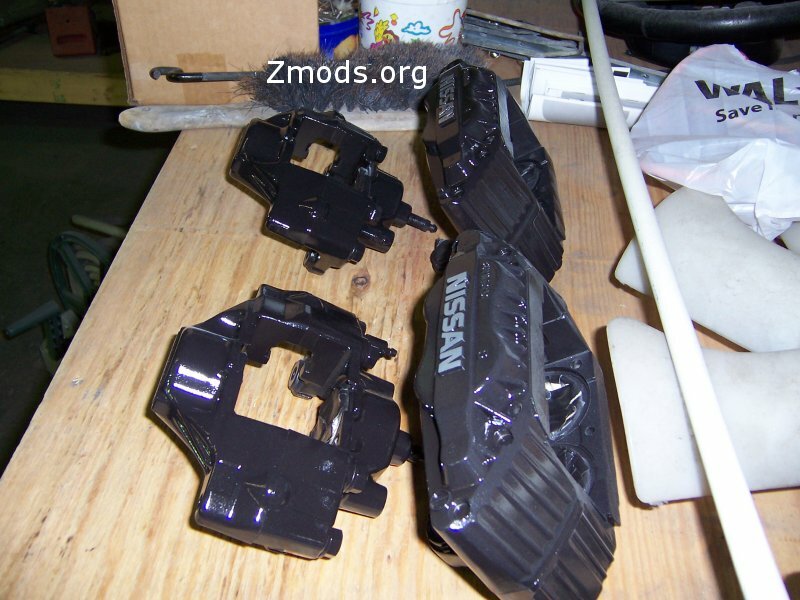 Rig hangers to hold the calipers for painting. Do not set them on flat surfaces, you won't be able to get the underside, and it will definitely show in the end!! When making your hangers, set them so you have 360 degree access around them, so you can coat them evenly. This is it!! 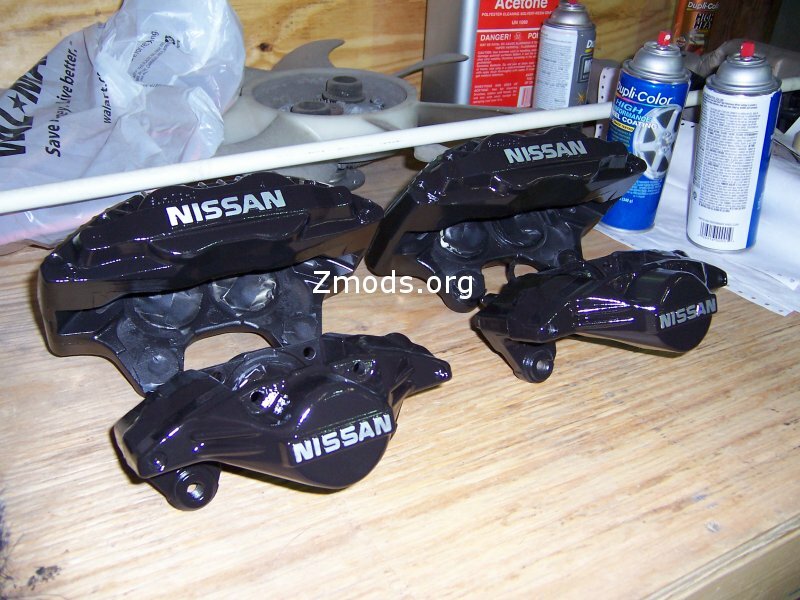 This sequence covers spraying the base coat on the calipers. I used Duplicolor's high temp flat black as a base coat. This paint requires no primer, and can withstand temperatures up to 1200 degrees! Follow the directions on the paint can, as that's the best way to start. Lightly coat the calipers the first couple coats, letting it tack up for a few minutes between coats. 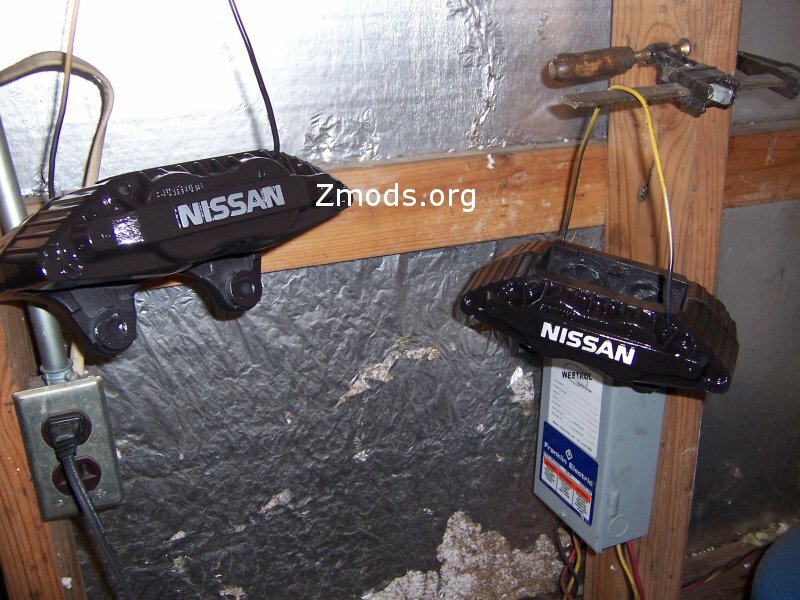 Allow the calipers to hang and dry for 24 hours. This sequence will remove the paint from the raised letters, If you want the letters the same color as the calipers, you may skip this sequence. 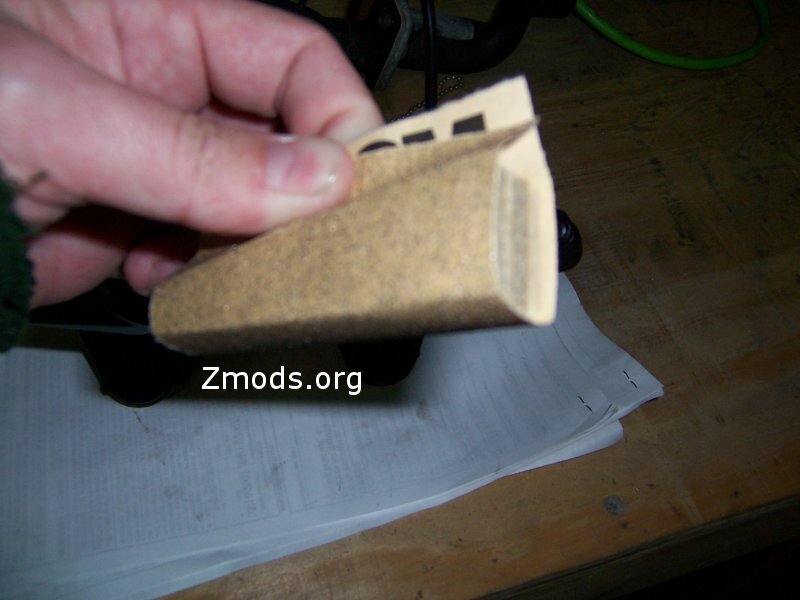 You'll need a sheet of 100 grit sandpaper and a sanding block. I used a scrap piece of a 3/4" plywood with a flat surface. It was the perfect width to cover the lettering, but not overlap the rest of the caliper too much. This is helpful for avoiding acidents. 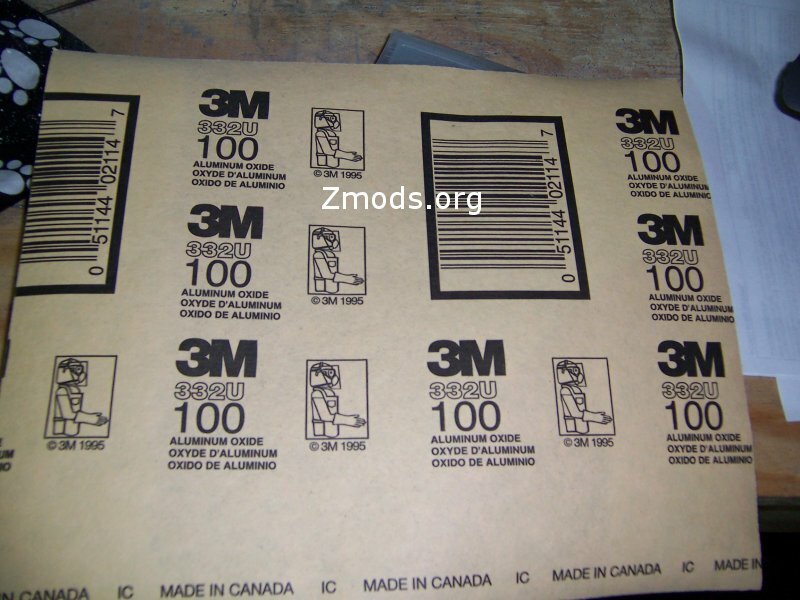 Wrap a small piece of the sandpaper around the block, making sure its pulled snug, so the paper won't slip. Sand the lettering side to side until all the paint and texture is gone. You're finished when you've got a sharp and clean brushed look. 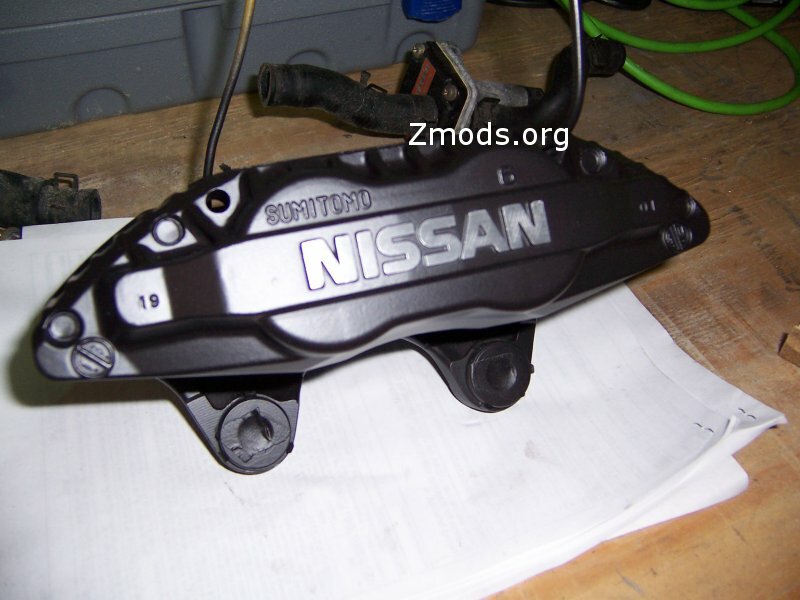 On the rear calipers, the letters are smaller and not raised as high as the fronts. Use extreme caution not to angle the block, or you'll end up having to touch up or re-shoot the entire caliper!!! When you're done, hang them back up, its time to clearcoat them. This is done similar to the paint process. I used Duplicolor wheel clear, which is high temp. Apply several thin coats, allowing it to tack up between coats. Apply several thicker coats, again, allowing it to tack between coats. If when applying the thicker coats, using the Duplicolor wheel clear, you may notice a white milky appearance in the coating. This is nothing to be alarmed about, it will clear up as the coating begins to cure. Allow them to dry overnight before handing them. I recommend letting them sit a couple days before reinstalling, to insure it's thoroughly dried. 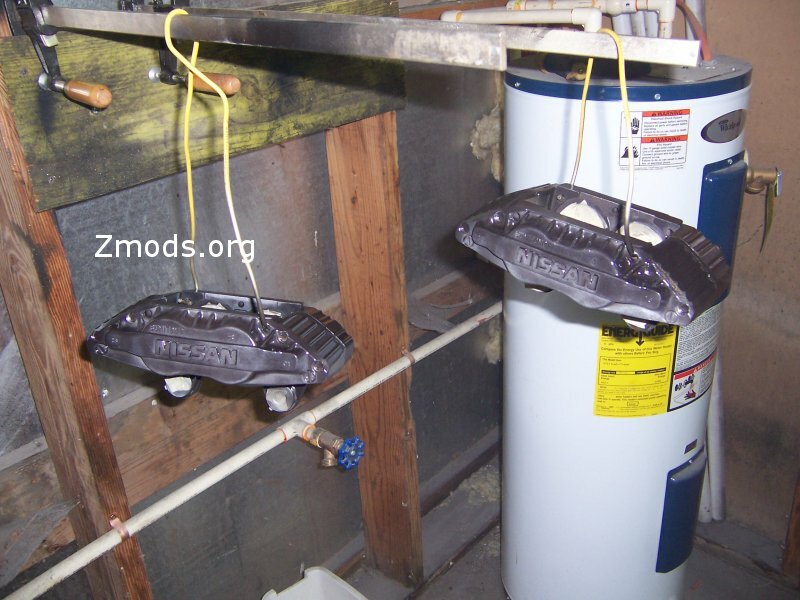 After they're dried, remove all the tape, old bleeder valve, and whatever you had covering the brake line opening. This one is also very cut and dry. Simply reassemble everything the opposite of how you took it apart, which is outlined earlier in the writeup. 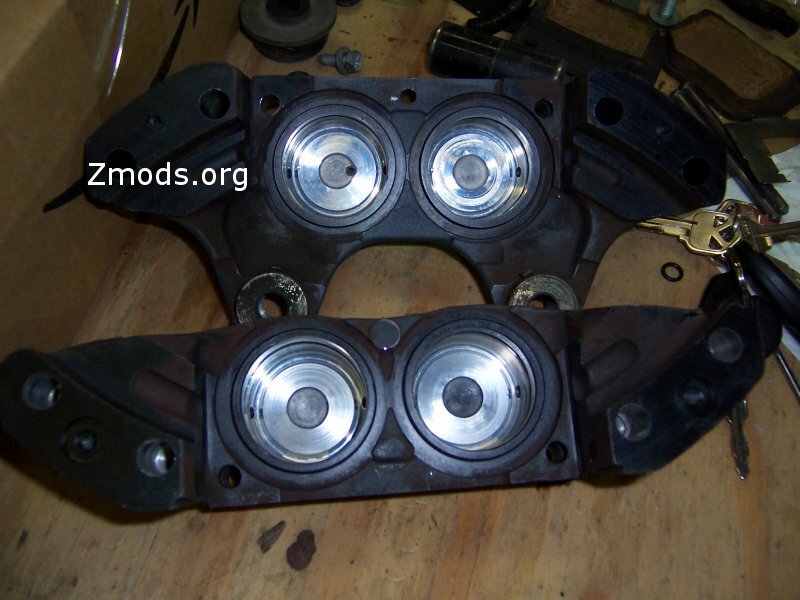 Clean the pistons thoroughly, removing fluid, dirt, and gunk. Just use a rag and give them a good wipe down. The new O rings will have grease on them. Do not wipe this off! Slide the O ring into its seat, making sure that its in there uniform. They will twist up easily, so make sure it doesn't do that. You'll know it if it does, you'll never get the piston back in! 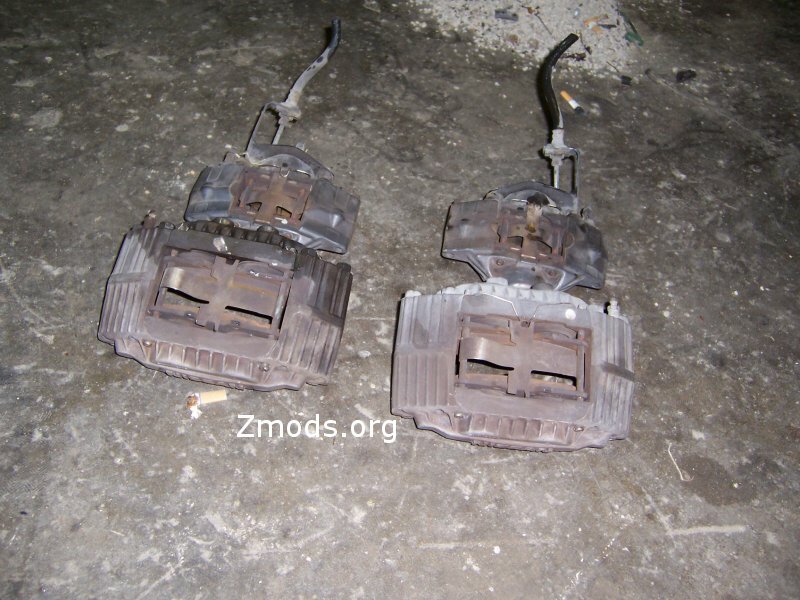 Since these are the old ones being reused, wipe them down to clean any dirt and fluid off of them. In your rebuild kit for the front calipers, you'll notice a packet of brake grease. Use a little of this on the O rings to slick them up, and then reinstall them the same way outlined in step 2a. Now it's time to reinstall the pistons. 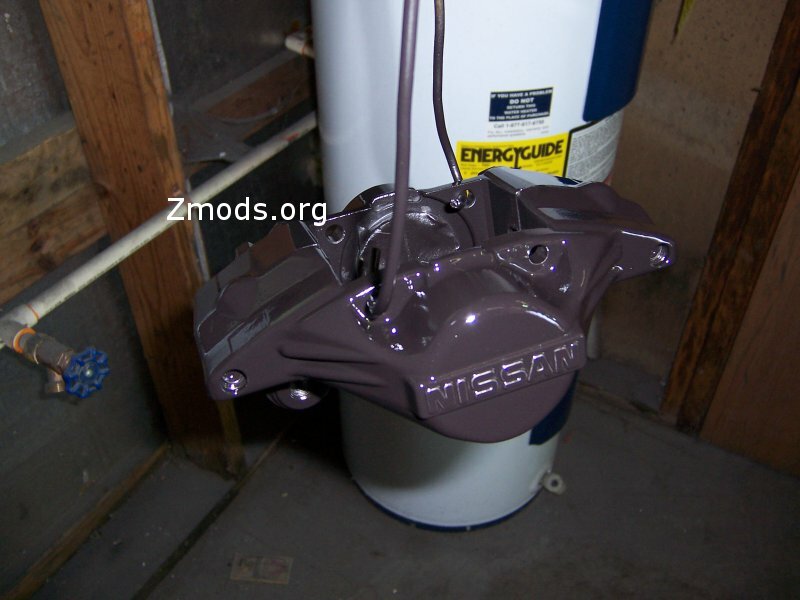 Use a little of the pink brake grease and lube the side of the piston. 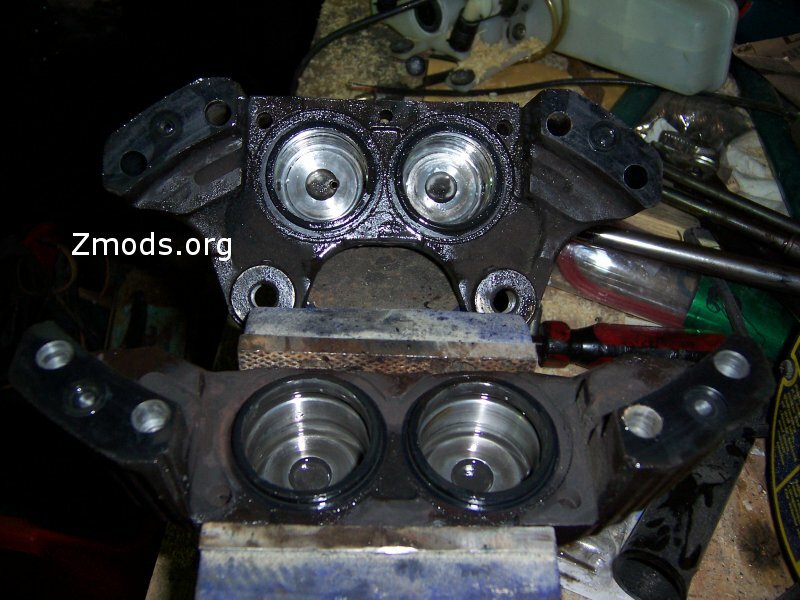 Start the piston into the cylinder, and slowly push it in. DO NOT PUSH THE PISTON ALL THE WAY IN!!!!!!!!!!! You need to leave them sticking out a little to reinstall the dust boot. If they're all the way back, its a pain to get the boot on!! Now put the dust boots on. 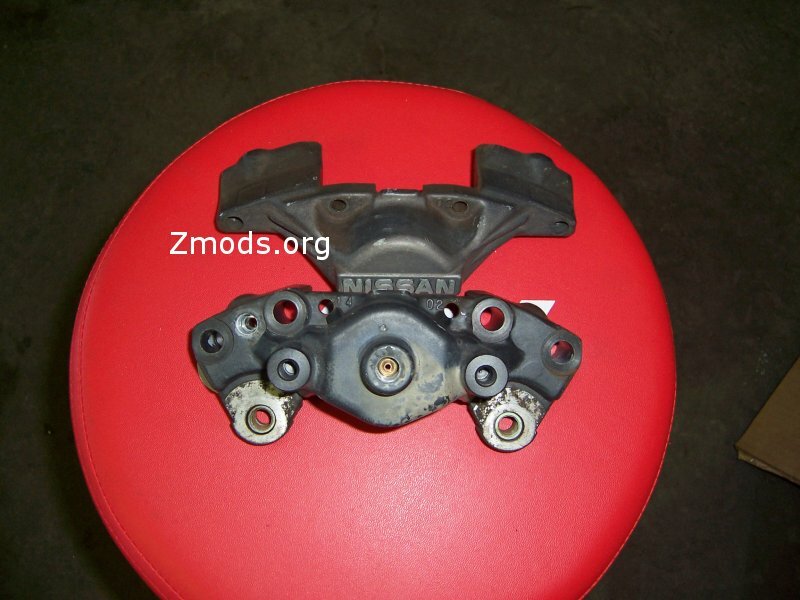 On the rear calipers, you might want to clean them up with some brake cleaner first, to get the gunk off them. 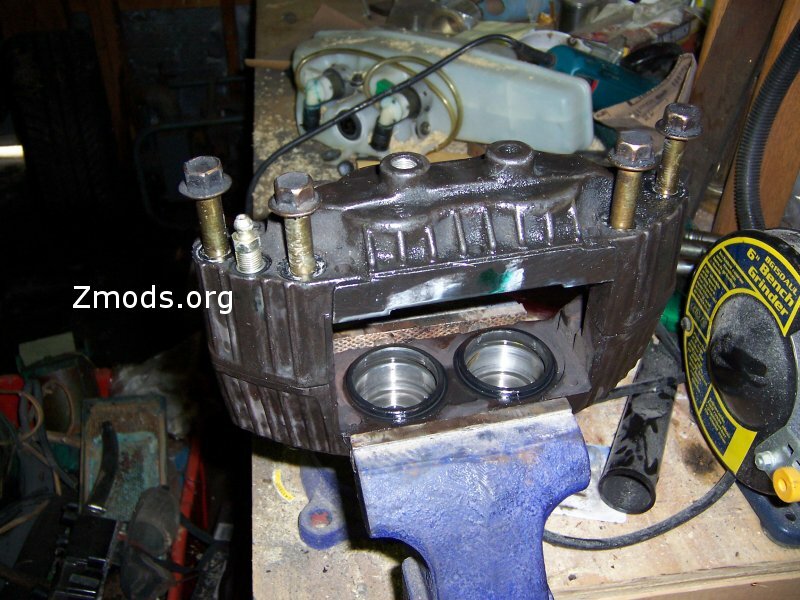 Place it over the piston, allowing the boot to seat itself in the groove on the piston. NOW, you can push the piston all the way back in! Once the piston is all the way back, massage the outer edge of the boot until you feel it slide over the lip on the cylinder and seat. Then take the retainer rings and put those back on. Simply pull the ring open at its seam, place it into the groove on the dust boot, and let go. it will snap right into place. Verify it is seated by looking at it all the way around. Install your new speed bleeders if you elected for those, and tighten them down. That's it!!! You're now ready to reinstall them on the car, and bleed them down! I hope you found this article useful!